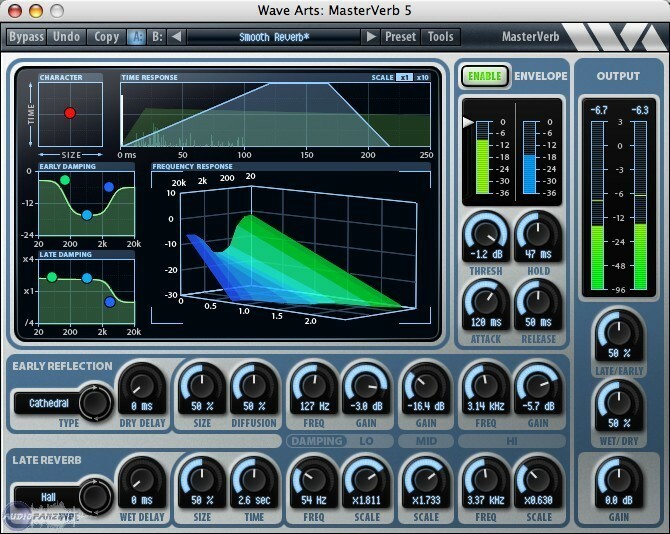 MasterVerb 5, Software algorithmic reverb from Wave Arts. 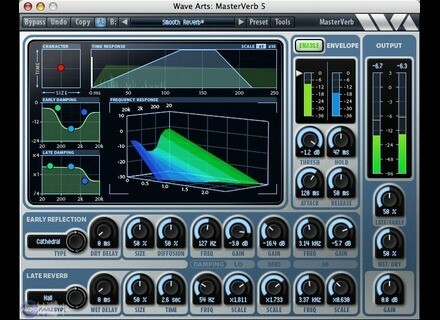 Wave Arts has updated its entire plug-in range to v5.49. (Mac) Snow Leopard compatible (fixed graphics glitch). Fixed problem with TrackPlug menus sometimes not working. Fixed TrackPlug Height knob not reverting to default value properly on certain bands. Fixed Mac installer issue (running it the first time would result in Resource Not Found error). Fixed occasional graphics glitch in MultiDyanamics in which hi/lo arrows appear above frequency display. Fixed pops in MAS versions when using pre-render mode or bouncing. Fixed RTAS/AudioSuite window bugs (wrong offset, controls behaving strangely if RTAS/AS window open at same time). Fixed issue with vintage RMS compression causing constant attenuation for thresholds below -48 dB. Added peak input/attenuation level displays in TrackPlug. The Lower Rhythm Grotto The Lower Rhythm has announced the release of Grotto, a stereo reverb / delay hybrid designed to focus on producing lush, cave-like environments. eMedia TimeStretch eMedia Music Corp., publisher of the world's best-selling series of guitar tutorial CD-ROMs, announced the release of TimeStretch. acid.milch&honig acidrack acid.milch&honig has announced the release of acidrack, a small freeware virtual analog style synthesizer plug-in.